I don’t work Fridays, so after my very snowy run this morning I rushed around like a crazy person getting all necessary shopping and chores done so that I could have a head start on my Stitch Tease marathon sewing weekend. I haven’t touched the sewing machine all week – and it feels soooo good to be back! 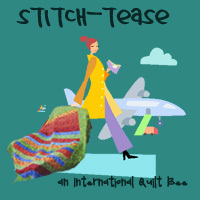 You might remember that I’ve been in the Stitch Tease bee for a good while now – it’s a secret bee and involves making panels or big blocks in secret for the other members – in the spring we’ll be done and then we’ll each receive our completed quilt top. Because there are only 8 of us the individual pieces are pretty big – and some of the requests are pretty ambitious and creative….so I kind of got cold feet and am a couple of months behind. This weekend is catch up time. My husband is away skiing and the teenagers are doing their own thing, so after my first week (well, ok, 3 days) at work in almost two decades I’m claiming the weekend for myself. Right now I’m working on Di’s block – she wants words and I’m hoping to get to Susan’s too. Susan wants scrappy stars – with white stars and a scrappy backing. Di’s is tricky and I’m having to be creative, but Susan’s will be much more within my comfort zone. It’s good to be sewing. Love it, love it, love it!!! 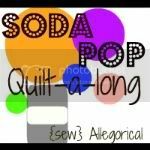 This entry was posted on Friday, January 25th, 2013 at 4:03 pm	and is filed under Quilting. You can follow any responses to this entry through the RSS 2.0 feed. Both comments and pings are currently closed. Woo hoo a whole weekend to yourself. Enjoy! Love the letter on di’s block – wonder what the word is? Yay! I’m in your comfort zone. Your sneaky peek of Di’s looks good though. Have a great weekend. Wish I were there to share it with you. Oh what fun we’d have! Yay, have a fab weekend! Enjoy your weekend, you’ve earnt it! I’m laughing outloud at Di’s comment!! You should be able to knock out Susan’s no trouble and looks like you are progressing with Di’s. I hope you have been having fun and sewing lots.